We are committed to forming close partnerships with our clients, enabling us to understand your unique situation and customise the assistance we provide to suit your requirements. Our commitment to excellence is evident in our hardworking team and our enthusiasm for our work means you get a friendly team of professionals eager to use their expertise to help you succeed. Paul joined the firm of Northwood and Barton in 1990 after 11 years as a finance accountant and IT specialist with Kimberley-Clark Australia Pty Ltd and prior to that as a company auditor. Paul has a keen interest in agriculture and the fishing industry and, in particular, ensuring that the valuable assets contained within these businesses are protected and passed to the next generation with minimum fuss and taxation consequences. Estate planning is a widely under-utilised tool. Given the only two certainties in life are death and taxes it is far more rewarding to be sure the assets successfully bypass the tax collector on their way to your chosen beneficiaries. Ron has been involved in public accounting and taxation for 37 years. He initially joined this firm (then Northwood & Barton) as a 16 year old for two years. After a stint in Adelaide pursuing his love of football with the South Adelaide Panthers and continuing his career working for public accountants (7 years) and as an accountant in the real estate and retail sectors, he rejoined the firm in 1985 as a Taxation Advisor. Ron became a Principal & Director of this firm in July 2003. Ron has a depth of experience in all aspects of our taxation laws and specializes in capital gains tax, GST and fringe benefits tax. He also applies benchmarking tools for our business clients in the retail and hospitality sectors. Over the years Ron has been heavily involved in the playing, coaching and administration of the sporting clubs in our district. Born and raised in Millicent John has had experience in the car industry and has operated a small business in the sport/entertainment sector. John was also an employee at the Kimberley-Clark Aust Pty Ltd's Millicent Mill. He began public accounting with Northwood & Barton in 1990. As a third generation accountant, John is particularly interested in wealth accumulation for families through investment in share portfolios and real estate and provides advice to a number of small business clients from start-up to succession planning. Bronwyn's family are directly involved in agriculture & horticulture and she has a sound understanding of the challenges facing farming families and of those of small business in the community and region and applies this in her role as a professional tax consultant. Bronwyn is involved in the Self Managed Superannuation side of our business where we assist clients in administering of their own retirement funds. Self managed superannuation funds (SMSF) are an essential tool in assisting our clients to further develop their wealth & provide their families with a wide range of business integration, succession, retirement and estate planning strategies. 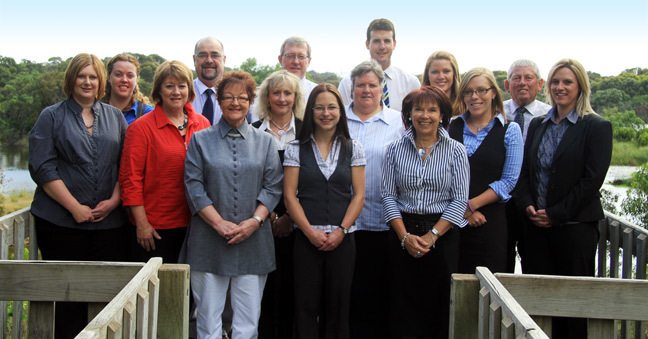 Supporting our professional accountants are 6 highly trained and skilled staff who perform the background tasks such as lodgement of tax returns, client bookkeeping and wage processing and massaging client records into financial reports. The frontline staff are Maryanne Clifford and Mandy MacFarlane. They provide the friendly face and voice of our business as they welcome clients, direct your enquiries to an appropriate professional and make the appointments. The backroom support consists of Sue Szabo (data entry, bookkeeping, financial reporting, BAS preparation), Victoria Lucas (BAS preparation and tax lodgement), Heather Douglas (bookkeeping, BAS preparation and tax lodgement) and Caroline Schulz (tax returns, bookkeeping, BAS preparation, data entry).